We’ve had only five days of NBA games, and already the league’s scoreboard operators are calling in sick, complaining of exhaustion. OK, not really. But have you seen the scores so far? We’ve had 35 games through Saturday. In all but six, both teams scored more than 100 points. We haven’t had a game yet in which neither team reaches triple digits. But the raw numbers get crazy too. The Pelicans dropped 149 points in regulation on the Sacramento Kings on Friday, after putting up 131 against Houston earlier in the week. Offensively challenged teams like the Knicks, Grizzlies, Kings, Mavericks, and Pacers have all scored more than 125 points in a game. 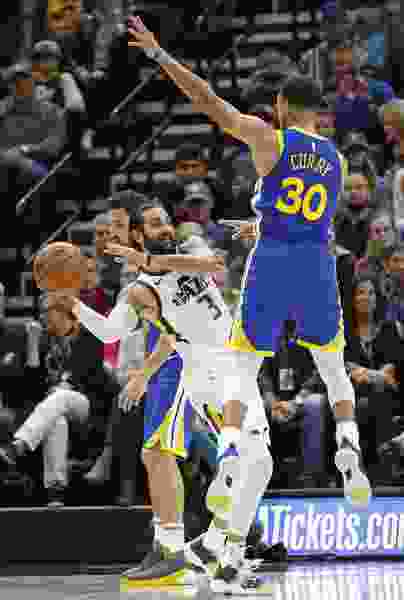 Some of the league’s best defenses aren’t immune; the Jazz have allowed 120.5 points per game through two contests, but even the Spurs and Warriors are allowing an average of more than 110. What’s going on? Well, a large part of the story is the number of possessions in every game. Right now, teams are averaging 101.9, last year, the average was 96.7. Those extra 5.2 possessions per game lead to more points, though teams are also converting at 1.8 points per 100 possessions better this year than last year right now. In other words, you might explain the scoring explosion as 75 percent an increased pace of play, 25 percent better efficiency. Those extra possessions aren’t necessarily coming from teams running up and down the floor more quickly, or more often. A big part of the change is the league’s increased fouls due to the freedom-of-movement point of emphasis. The league’s calling about three more fouls per game than last season so far, and 41 percent more offensive fouls than last year. Each of those offensive fouls means a new possession for the other team, and defensive fouls mean a change in possession if it’s shooting, or if a team is in the bonus. The league changing the shot clock to reset to 14 rather than 24 after offensive rebounds has also added more possessions. But in that context, the Jazz, after finishing last season 25th in pace, have started the season sixth. To be abundantly clear: this is only through two games, and to a large degree the stats are a factor of the teams the Jazz have played: the famously-fast Warriors and a revamped young and fast Sacramento team. Even on their own offensive possessions, though, the Jazz are finishing them faster. That’s especially true after a team misses a shot: last year, the Jazz finished those possessions in 12.2 seconds on average, they’re down to 10.2 this year. They’re more than a second faster after forcing a live-ball turnover, too: 9.8 seconds last year to 8.4. Instead, he wants to increase how often the team “thrusts” the ball quickly up the court, regardless of whether it’s after a make or miss. More than any other Jazz team he’s coached, this group features natural runners, players who love to get up and down in the open court. Compare George Hill, Rodney Hood or Joe Johnson’s style to Ricky Rubio and Donovan Mitchell. And this year, the bench units love getting out in transition, led by Dante Exum. Good spacing can help lead to a fast-break layup or corner 3-point shot, or just set a team up for half-court success. Finally, there’s another contributing factor: increased player confidence, in part due to last year’s success and roster continuity. Rubio and Joe Ingles are two guys who have seemed hesitant to take open shots in years past, but they’re firing away now. That, too, means quicker possessions. “You’ve got guys who are more comfortable taking the [first] open shot, which is good, because sometimes you don’t get a better look later in the possession,” Snyder said. No one really expects the Jazz to finish in the top 10 in pace of play. But those around the team think they do have a shot at a top-10 finish in offensive efficiency.